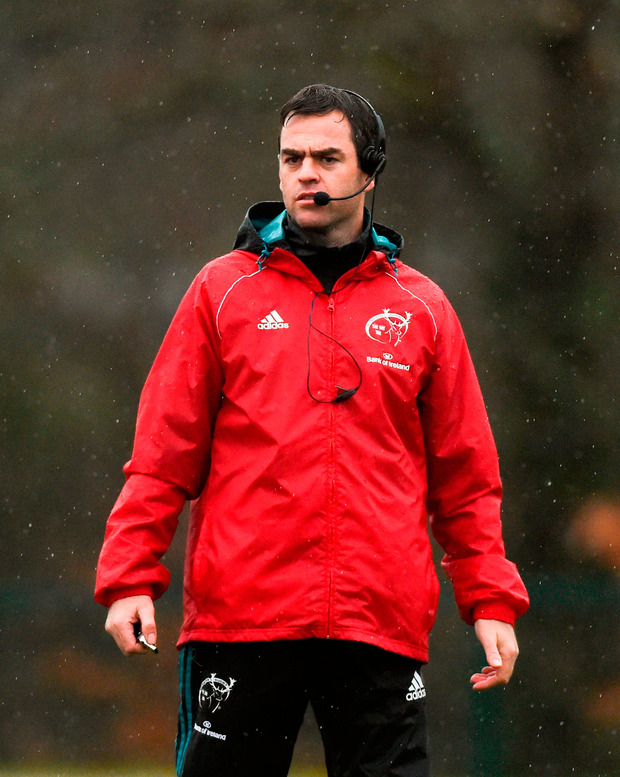 Johann Van Graan has admitted that he is far more prepared for the European back-to-back games than he was 12 months ago when he was plunged into the crucial ties having only just taken over at Munster. The South African hit the ground running and his team beat Leicester home and away on their march to the Champions Cup semi-finals. Having drawn their opening away game and secured a bonus point in their first home match, the province are in a remarkably similar position this season as they face into two meetings with Top 14 champions Castres in six days. Back then, everything was a new experience but now he knows the territory. "Look, I would like to say (I am) a lot better prepared than a year ago," Van Graan conceded. "Obviously, it went pretty well the first two games against Leicester. "At least a year in you have kind of had everything now for a second time, last year was the first time, now it's the second time that we are going into this block. "But the challenge remains the same, we have the French champions coming here and then we have to go over there next week. "They are a quality opposition and like I said we have to really make sure that we get our planning done in the week. "They play in a very specific way. I believe that is why they got such positive results and you don't go away from home in France, win two games, a quarter and a semi-final, and go to Stade de France and win the Top 14 if you are not quality." In retrospect, the baptism of fire might not have been such a bad thing as the Pretoria native was forced to learn and adapt on the job. But he is quick to turn the focus back on to his players and the task at hand. "Like I said from day one, it is never been about me, it has been about the team. We believe in our team. For me personally, I have enjoyed every single moment of it, I do every day," he said. "It is never work where I drive here in the morning. It is all about coming to enjoy the day, enjoy what we are about and where we, hopefully, are going. "It is no different than a year ago. The most important thing is what we do and players are happy and the management keep growing and we are taking each day a step of growth and becoming a better team. I think we have done it over the past few weeks." Unbeaten since their loss to Leinster at the Aviva Stadium in early October, Munster warmed up for Sunday's clash with an excellent performance in beating an understrength Edinburgh last Friday night. This week's opponents, meanwhile, slipped up at home to Agen - a rare off day at their traditional fortress. Castres have never been convincing in Europe, but this year there are signs they are taking things a little more seriously after they secured a losing bonus away to Gloucester in round one and beat Exeter in round two, despite being reduced to 14 men in the first half. Van Graan prides himself on his opposition analysis and he has been impressed with the French champions who possess far fewer marquee names than their big-spending rivals. "They play quite differently to most French teams," he said. "They are very structured in their kicking game. In my opinion quite a few teams have fallen into the trap of trying to play against them too much. "They use their numbers 9 and 10 with their distant kicking game. (Robert) Eberson at No 13 is pure class in the way that he organises that defence. Uncomfortable "They force you into overplaying and getting you into uncomfortable positions. Then they've got a pretty big poach threat and, even if you look at the Exeter game, they were very good at what they do - force pressure and penalties. Then their maul comes into it and once they get that maul going it is pretty difficult to stop. "Obviously they are big... Their kicking game and the way they squeeze their position into pressure. That's their biggest threat." They have, he believes, changed since the teams last met in January. "All teams evolve and especially, in my view, if a team are successful and are looking to take the next step," Van Graan said. "Some of the things that they do is exactly the same, let's say the structural stuff, but certain small parts of their game they have definitely grown. "They seem a lot fitter this year and that is why I said some teams fall into the trap. "That is why I said we have to be very specific in the way we approach them in the next two weeks because they do force a lot of errors." Meanwhile, Munster scrum-half James Hart looks set to join Biarritz, according to reports in France. The Basque side are enduring a difficult period and are currently languishing in the PROD2, but they have secured €5m investment and are building a new stadium in the hope of making a comeback.